Well, baseball season officially kicks off today and although I wouldn’t call myself a die hard fan of any one team, I do enjoy casually following the Boston Red Sox. Before their rise to World Series champs in the 2000’s, Boston was the team you went for if you liked the underdog. They had a great history behind them, an iconic ballpark to play in, and their red “B” logo on the blue cap is just classic. They won the first ever World Series in 1903 and after winning it again in 1918, sported one of the longest championship dry spells in MLB history, supposedly due to a curse brought upon them when their owner sold Babe Ruth’s contract to the Yankees to finance a Broadway play. “The Curse of the Bambino”, as it came to be known, is one of the most enduring and interesting stories in baseball’s folklore. Another great piece of Red Sox history is the story of “Tessie”. There was a contingent of Red Sox fans in the early 1900’s known as “The Royal Rooters”. They used the song “Tessie” from the musical “The Silver Slipper” to both energize their own players and frustrate the other team. Growing up in Atlanta, I would have to equate this to the “Tomahawk Chop” we so effectively used in the 90’s. “Tessie” became a rallying cry for the Red Sox and is still used at Fenway Park today. 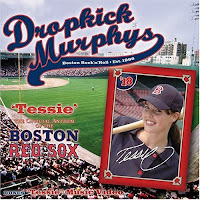 In 2004, Boston’s own Dropkick Murphys worked up a new version of “Tessie” with updated lyrics and music. What’s not to love? A great anthemic song performed by a rowdy punk band who really love their hometown team, brilliant! It was released in August and the Red Sox won the World Series in October. You be the judge if it was just coincidence or another “Carlton Fisk waving the home run to stay fair” bit of Red Sox magic. Either way, this song is absolutely fun to listen to and will have you rooting for the Red Sox in no time! Who am I kidding, you can’t talk about the Red Sox and music without also throwing a little love to “Sweet Caroline” courtesy of the legendary, one and only Neil Diamond.